Butterscotch Shenanigans just released their highly-rated top-down action RPG and it's epic. 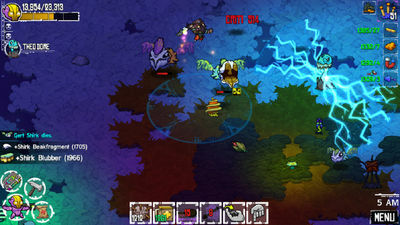 "Crashlands" for Android is all about crafting and mining resources to survive on a far away planet. It's an incredibly compelling mixture of gameplay mechanics combining carfting and RPG action elements. Crashlands starts with you, an intergalactic delivery driver, crash landing (obviously) on an unexplored planet. From the debris of your craft and indigenous materials you need to find a way to deliver your packages... First you need to build a base, then construct armour to protect yourself from the mean and creepy creatures stomping about your new home. And it keeps branching and adding new story threads and ideas. - Explore the new planet and unlock 500+ items to craft. - Automated unlimited inventory that has you focusing on other things like questing and building. - Your character will develop new abilities and venture to new places as you progress through the game. - Craft powerful items and fight your enemies in epic skill-based battles. - Base building in Crashlands is an easy and fun task. - Craft new creatures to help you in combat. - Planet Woanope is a huge world, make it your temporary home, explore it, and survive! 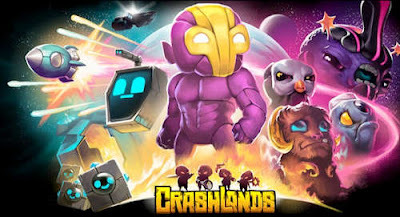 - Crashlands save games are a way to play anywhere anytime on any other device. - Intricate story, sending you from NPC to NPC in order complete basic resource acquisition tasks. - Bug fixes including Hewgo fight trap in space, extra buttons not despawning, etc. Install the Apk file and play the game. If you require an outdated version, comment and let me know. how should we play this game if there is no cache?